The resource context menu appears when you right-click on a global (cluster-wide) resource, as shown above, or a server-specific resource instance, as shown below, in the status table. The default resource context menu is described here, but this menu might be customized for specific resource types in which case the menu will be described in the appropriate resource kit documentation. The actions are invoked for the resource that you select. If you select a resource instance on a specific server, the action is invoked for that server while if you select a global (cluster-wide) resource, you will need to select the server. In Service. Bring a resource hierarchy into service. Out of Service. Take a resource hierarchy out of service. Extend Resource Hierarchy. Copy a resource hierarchy to another server for failover support. Unextend Resource Hierarchy. Remove an extended resource hierarchy from a single server. Add Dependency. Create a parent/child relationship between two resources. Remove Dependency. Remove a parent/child relationship. Delete Resource Hierarchy. Remove a resource hierarchy from all servers. Local Recovery – Select Yes to enable Local Recovery for this Resource. Local recovery for a file share means that if the folder becomes inaccessible, SIOS Protection Suite will attempt to re-share the folder. Quick Check Interval – Enter the interval (in minutes) between basic checks of the resource’s availability. Different values can be specified for each system. The default value is 3 minutes. The value range is between 0 and 10080. Setting the interval value to 0 will disable the quick check feature. 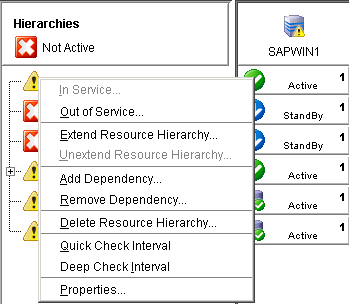 Deep Check Interval – Enter the interval (in minutes) between extensive checks of the resource’s availability. This program utilizes Quickcheck for its Deepcheck implementation. Different values can be specified for each system. The default value is 5 minutes. The valid entry range is between 0 to 10080. Setting the interval value to 0 will disable the Deepcheck feature. Properties. Display the resource properties dialog.